Our 2 bedroom condo is full size, not a loft, and feels more like a house, with the bedrooms upstairs. 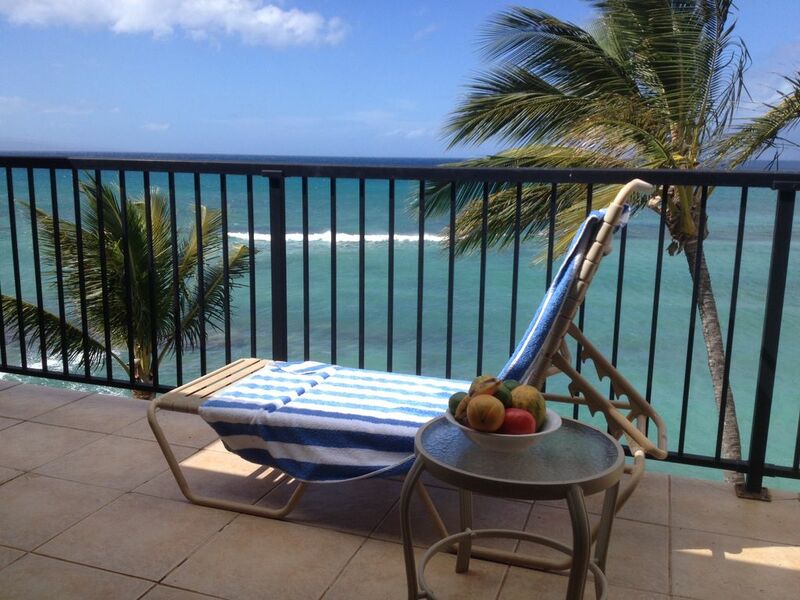 The condo is in a well maintained low rise complex, 100% ocean front,that hugs the shoreline on Maui's famous West Side, and is situated on a picturesque, reef-protected sandy cove, uniquely away from the main road. There's always a sandy beach that spans from the North end of our complex, and a sunny pool for your enjoyment. The water is very suitable for swimming, surfing and snorkeling. The beach is a slow 2 minute walk from the condo itself and the pool a minute away. This comfortable and well appointed two-level townhouse style condo ( unit #A204, not ground floor) offers breathtaking, completely unobstructed views of the neighboring islands, Molokai and Lanai. Enjoy the soothing sounds of the surf from the 2 spacious, private lanais (balconies) located off the living room and the master bedroom. Both offer a very unique vantage point for whale and sea turtle watching, and for enjoying our legendary Hawaiian sunsets. While tucked away in a private, quiet spot, we are ideally situated, a short stroll to the Farmers Market, and a short drive to the supermarket, restaurants and the Lahaina Cannery Mall. The charming and historic town of Lahaina, with it's eateries, quaint shops and local art galleries is an easy 10 minute drive away. Kaanapali with it's world reknowned beaches and Kapalua with it's beautiful oceanfront PGA Tour golf course, are also just minutes away. As a bonus to our guests, free wireless internet access. Parking is also included in our rate. If you do call or email, PLEASE ASK FOR UNIT A204.Thank you for your interest. We would be delighted to have you as our guests. ALOHA ! ps. If our unit is occupied for the dates you wish to visit, please email us and we'll refer you to other similar units in our complex.